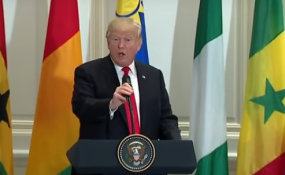 United States President Donald Trump addresses African leaders in New York. FOREIGN Affairs secretary James Manzou says the continued existence of US and western imposed sanctions on Zimbabwe went against government's current efforts to mend bridges with its former allies. He was giving oral evidence before parliament's foreign affairs committee on Wednesday. Manzou said conditions in the country had greatly improved since President Mnangagwa took over as the country's leader 2017. "Zimbabwe's re-engagement processes are a key component of the ministry to normalise all aspects of the country's relations with the West, reopening all lines of communications with a view to achieve the full unconditional removal of sanctions and other unwarranted punitive measures imposed on our country. "Political space in Zimbabwe is now open since November 2017. Zimbabwe has nothing to hide; visitors are coming to see democracy at work in this country. "The government is opening a new chapter with the world and we want to a play positive role with the processes. "In meetings with West, the President sought to find ways to end sanctions." US President Donald Trump this week renewed by another year, his government's targeted sanctions on Zimbabwean authorities and associated firms citing continued failure by the Zanu PF led administration to restore the country to full democracy. Manzou said the sanctions should go adding that President Mnangagwa has opened dialogue with hostile Europe. "Zimbabwe, this February launched the inaugural informal political dialogue with the EU but EU renewed its unwarranted sanctions on Zimbabwe from other European countries bent on seeing Zimbabwe being isolated," he said. Manzou told the committee that the Commonwealth has indicated that it would want to send representatives to Zimbabwe as part of its continued assessment of the situation in the country.